Save the whales—and the actors! Inspiring, real and heartwarming, Big Miracle is something of a miracle itself—a family film everyone in the family can love that doesn't talk down to its audience and makes more salient political points than Free Willy or Dolphin Tale. It's the true story of the attempted rescue in 1988 of three whales trapped beneath the ice in Barrow, Alaska, an effort that brought an international community—continually at odds with each other—temporarily together for the purpose of freeing these magnificent creatures. Box office may not be a huge splash, but word of mouth should be good for this whale of a tale that could drive decent business throughout February due to a dearth of good fare for kids and their restless parents. Although the whales are clearly the star of the show, the plot revolves around the sometimes precarious relationships of the people trying to save them. 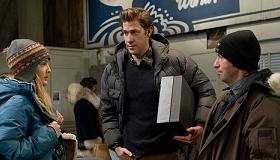 Chief among these is cameraman/newsman Adam (John Krasinski) who is in Barrow working on a mundane story when he discovers the plight of the whales He tells his ex-girlfriend (Drew Barrymore), a hot-tempered, fiercely devoted Greenpeace activist, who jumps on it and immediately tries to get the National Guard involved. At the same time, a PR-conscious big oil executive (Ted Danson) decides to get his company involved knowing the free publicity can only engender good will towards his unfeeling corporation, which could boost his plans to drill in the Alaskan Arctic Circle. In no time, the whole situation goes viral (and this is 1988, well before the internet would have this around the world in minutes) as the military, the Russians and even President Ronald Reagan wade into the fray. A subplot about Adam's infatuation with an ambitious newswoman (Kristen Bell) does nothing to advance the story, and eventually gets pushed to the background as the rescue effort intensifies. The bulk of the film-and its heart-is set around the heroic efforts of everyone involved to bring this to a happy ending. Particularly touching are scenes where Barrymore dives into the freezing water hole to make direct contact with the whales, a feat fraught with danger. That this is all based on true events makes up for some of the more obvious "movie moments" designed to manipulate the audience's heartstrings. Real news footage and use of the network anchors of the time is nicely integrated into re-created scenes of the event, and adds gravitas to the proceedings. Director Ken Kwapis also makes sure the film doesn't drift too heavily into polemics while still managing let Big Miracle get in a few digs at Cold War politics and big business. None of the stars are going to win Oscars here, but after first half hour, Barrymore's one-note character softens a bit and begins to grow on you. Krasinski is a likeable presence while Danson, an environmentalist himself, has some fun with his gas-guzzling role. Bell overdoes it and seems superfluous while Adam's indigenous sidekick Ahmaogak Sweeney is perfectly cast. Cliff Eidelman's sweeping score is by the numbers but John Bailey's gorgeous cinematography soars. The whales—in truth, robots—look real at all times, and we care about them as if they were.